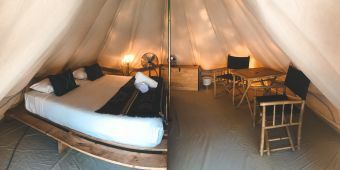 The bell-shaped glamping tents may look familiar, but the difference is that when you arrive they’re already made up for you. Not only that, you have quality bedding with a mattress set off the ground on wooden pallets, and cotton sheets and deluxe pillows that you’d normally find in a resort hotel, along with Armadillo interior rugs, bamboo deck chairs and table, cosy lighting and mains power. 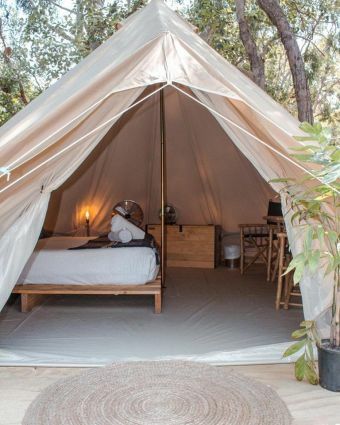 Set in their own grove of shady trees, the mini village of glamping tents provide a perfect way of connecting with nature, while raising both the convenience and comfort levels. You’ll share the well-maintained communal bathroom and cooking facilities, but have your own space to enjoy the beautiful surrounds of Adder Rock and its pristine beaches.